A statement issued by the legislator flowing the backlash he received in his response to the address by the Vice President few days ago on the state if economy said: “Mr Vice president, you threw a challenge that anyone who disagrees with you should come out with authentic data. We have provided you with same, and categorically affirm that your data is fictitious. This is not an insult. Just the plain fact. 1. I emphatically maintain that the Vice President deliberately deceived the nation by quoting false fiscal numbers. 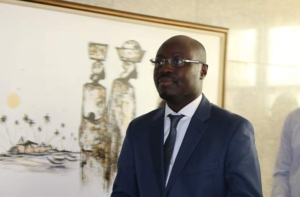 The Vice President, Dr. Mahamudu Bawumia, who doubles as the head of the Economic Management Team (EMT) quoted fictitious numbers which are in contrast with the official fiscal numbers published by the Ministry of Finance. 2. Our Vice President stated in paragraph six (6) of his presentation at the town hall meeting that the fiscal deficit for end year 2016 was 9.3 percent of GDP. “The economy ended in 2012 with a fiscal deficit of 12.2% of GDP, 11.7% in 2013, 11.9% in 2014 before falling to 6.7% in 2015, but rose again to 9.3% in 2016…..” – Bawumia Townhall meeting. 3. Reference is made to the annual Debt Management Report for the 2018 financial year which was presented to Parliament as recent as Friday, 29th March 2019 by the Finance Minister in fulfilment of the requirement of section 72 of the PFMA, Act, 2016 (Act, 921). 4. Page 21 and 22 of the annual Public Debt Report for the 2018 financial year and section on fiscal performance indicate that the deficit numbers are in contrast with what the Vice President presented at the town hall meetings. Clearly, the Vice President has lost touch with reality and not up to date with our public finances. 5. From Figure 1 above, the fiscal deficit from 2014 to 2016 was -7.4 percent of GDP in 2014, improved significantly to -4.9 percent of GDP in 2015, and ended in 2016 at -6.5 percent of GDP. In contrast, the Vice President made the claim that the fiscal deficit was 11.9% in 2014 before falling to 6.7% in 2015 but rose again to 9.3% in 2016 as indicated in Table 1 below. The Vice President compared non-GDP rebased fiscal deficit numbers with rebased GDP fiscal deficit numbers and could not even get his numbers right. These numbers can be confirmed via the links below. 6. Mr Vice president, you threw a challenge that anyone who disagrees with you should come out with authentic data. We have provided you with same, and categorically affirm that your data is fictitious. This is not an insult. Just the plain fact. “The data will speak for itself. If you disagree, then you should bring your own data and record but don’t disagree by saying that EMT members have big heads. You only resort to insults when you are allergic to the facts” – Bawumia Townhall meeting. 7. Having taken up the challenge and proven that you deliberately provided false fiscal numbers, the least the country expects is for you to be man enough to admit and apologize not to me but to the nation that you have deliberately misled. 8. Unfortunately, under your watch as the head of the EMT, Ghana is permanently trapped in populism and lies. This is sending mixed signals to our investor community and the average Ghanaian. Our citizens are suffering, so please stop the sloganeering and find real life solutions to our problems. 9. As H.E John Mahama said, “you can continue with all the lies and propaganda with your so-called macroeconomic data, but the reality of the livelihood of the people will expose you”.